NOT at Hawaii Volcano National Park. Mauna Kea – long dead on the North side of the Island. The observatory is on top of this volcano. Mauna Loa – Last erupted in 1984. About as tall as Mauna Kea with nothing meaningful on top. An access road, but not visited. Kilauea – Located on the side of Mauna Loa it physically is hard to distinguish as a separate volcano than Mauna Loa. It is where Volcano National Park is located. The active lava used to be between 80 and 180 feet below the surface of the caldera. Prior to May, 2018, from the crater’s edge you look down at the caldera and see the glow of the lava deep in the caldera. 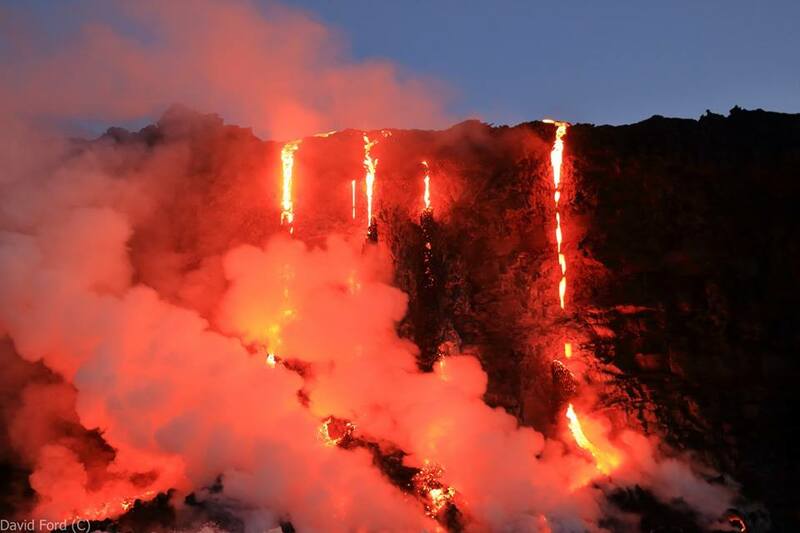 The lava comes from a vent/crack on the side of the mountain. The lava is fed by Kilauea. 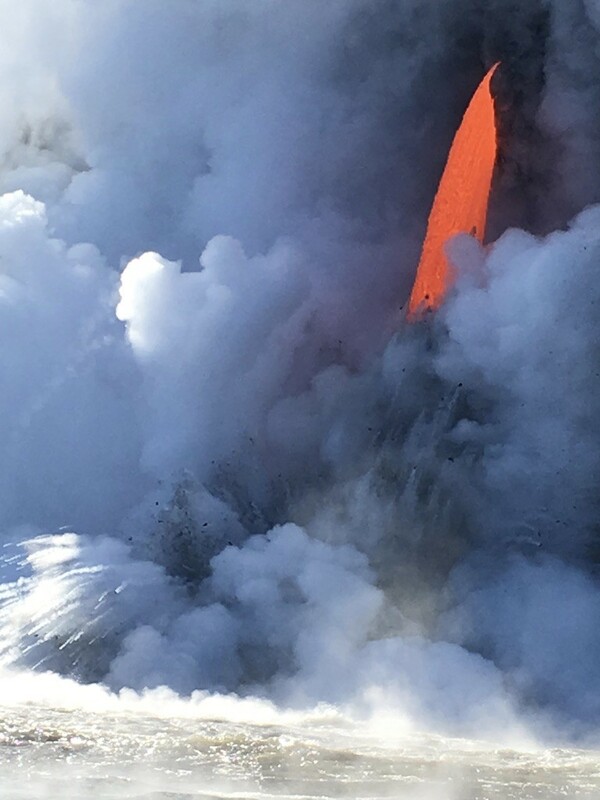 Prior to May, 2018 lava flowed through a vent called Pu’u o’o. This was about midway down from the caldera and was basically inaccessible because there were no road anywhere nearby. This vent erupted in 1983 and been flowing out of the vent almost continuously . It is the only volcano in the world to flow continuously. What happened about May 3, 2018?A newe set of fissures/cracks opened up much closer to the coast. Lava drained out of Kilauea and Pu’u 0’0 and poured out of these new fissures. Because this was in a residential neighborhood, it was a huge event. Not only lava, but vent gases vastly increased, affecting every place southwest or west, depending on wind direction. The area was open only to residents, making viewing by tourists impossible. 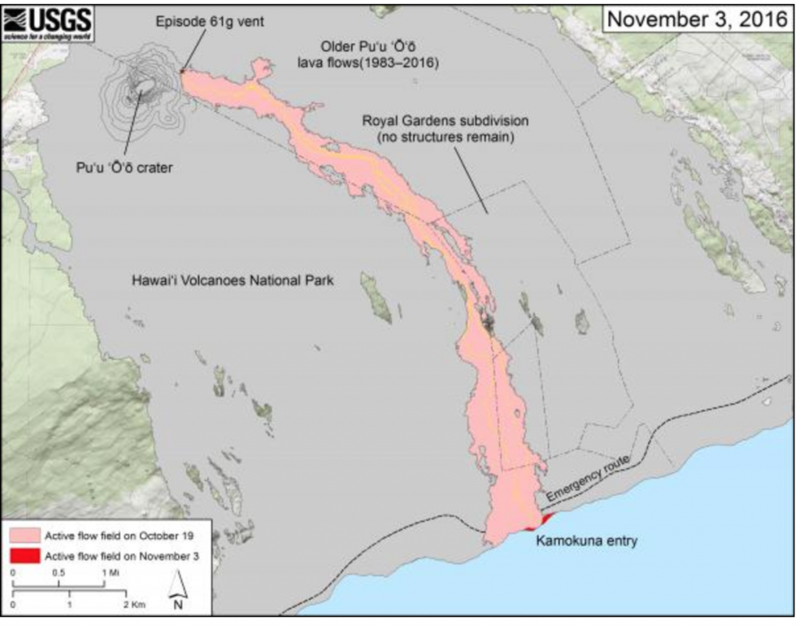 In early June, the new lava flow started flowing into the ocean, creating new land. By boat. NEW UPDATE as of August, 2018: There is no ocean entry of lava so boat trips are pointless. In addition, the local harbor near the lava flow was somewhat destroyed. As of 3/26/17 boats are required to be 300 meters away from the lava flow. That is three football fields away. In addition the USGS site https://hvo.wr.usgs.gov/activity/kilaueastatus.php states that there is no ocean entry. I do not believe boat trips are offered. If they are still offered, do not bother as there is nothing to see. When there was lava flowing, largest boat is www.lavaocean.com. The picture of the boat is below. On January 1st, 2017 26, acres of new shelf and old shoreline collapsed into the ocean. This sheered off the lava tube. The current view is a fire hose shown below from my trip in February, 2017. The boat went VERY close to the lave. Just beyond the spattering of rocks that explode when they hit the water. By bike. When lava did flow into the ocean, this was an option. Currently the road ends about 4 miles from where the lava used to flow. There is an access road now that runs along the coast. One took a bike along the access road and used to walk about 100 feet for a great view depending on the exact exit into the water. This allowed you more time at the lava and a vantage point above the lava drop into the ocean. If you wanted to get about 400 feet from the lava, this was the only way. The easy way to get a bike was to rent one. Simply drive to the end of highway 130. 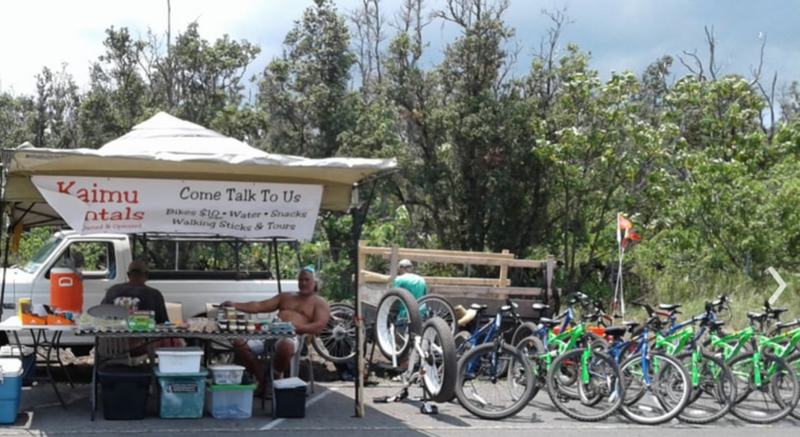 You will see a number of vendors renting bikes for $20. This is a great deal. It was pretty easy bike ride for $20 for an up close view of the lava. 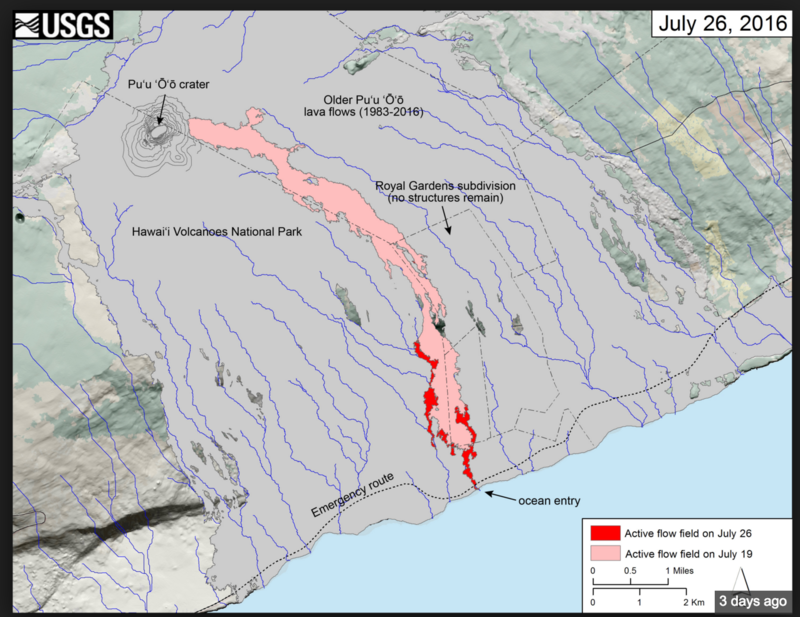 There are services that offer a hike to the lava break outs upslope. I would not recommend a these hikes. It is too far. One can also get an all inclusive bike tour. The cost for a bike tour is about $99. See www.Lavalandhawaii.com and www.pokeastick.com. NOTE: As of January 1st you can not see actual lave from land! By Helicopter. This is the best way to get an overview of the Big Island and the history of the lava flows. The rides are so stable, even those with a fear of flying will be relaxed. It is also the most trouble free. No hiking, rough seas or getting rained on. Lava will appear as a reddish glow below (if it starts again). The lava travels so slowly you won’t notice the flow, only the color change. The time you spend looking at any one spot is very limited. They don’t like flying low over populated areas, so often the distance to what is below isn’t close. You don’t take a helicopter ride for a focus on lava flow, but it is a great way of seeing the best of the Big Island. Cost is about $250. See www.bluehawaiian.com but there are others.